This time around Chris and his band have honed a classic. Unlike previous records, good as they were, this succeeds as it’s more integrated, more of a band production. 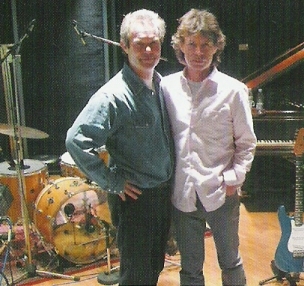 The songs are written by Chris and long time associate Charlie Hart but the arrangements and direction is more contemporary. Witness ‘15% extra free!’ checking out the consumer misnomer of getting something for nothing, all backed with a slick rhythm track spun together by drummer Malcolm Mortimore and son Jim Mortimore who not only worked tirelessly on the record but also plays pretty good guitar too. The combination of concept and execution is something that has eluded Chris in his previous Zydeco flavoured outings, though this territory is not deserted here in the shape of ‘Got me where you want me’ a duet with the luscious Miss Sam Brown. The two sound like they have been at it for a while, and for all I know they might have been. Catchy, yes and quite poppy in an old school way. 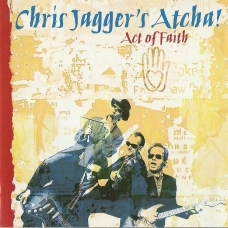 By contrast the ‘DJ Blues’ is funkier and dirtier with Jagger senior adding to the vocal gyrations. More Al Green than Brit Blues this song is an invitation to the DJ to stop jabbering and spin a decent record. 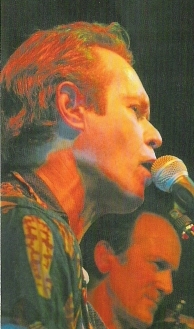 This fills the bill and historically the first time the two have sung together on an equal footing. I look forward to something similar on the next Stones record. The Atcha band ably back Mr Gilmour too, he of the Pink Floyd, on the moody ‘Junkman’ a dense minor blues with brushes and double bass, quite jazzified in fact. The overall feel of the record is Americana with a British twist and it’s good to see Billy Jenkins the wildcat guitar soloist represented on ‘Everybody Party’ a cynical take on the state of play in the Bush-Blair axis. Maybe we can’t change much but we might have a moan. The songs hang well enough together ad knowing the band play pretty good live it should be interesting seeing this material performed. 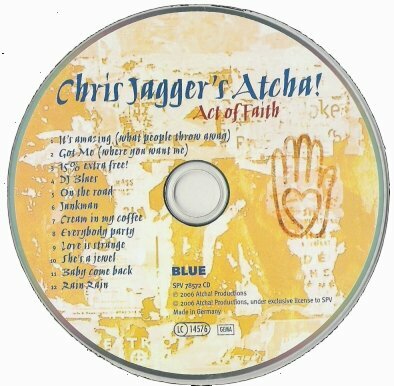 Added to their earlier stuff, on the defunct Sequel label and the band’s ‘Channel Fever’ record, ’Act of Faith’ should slot in alongside well enough. I hope it brings them some commercial success for they have worked hard enough at it over the years and deserve some.